High court delivers victory for taxpayers, law enforcement and state sovereignty. Sports betting is exploding in the U.S.
Americans bet more than $15 billion on the Super Bowl and March Madness — 97% was bet illegally. In the 2017 football season, an estimated $58 billion in illegal bets were placed on NFL and college games. Now that the federal ban has been lifted, it is critical for states and sovereign tribal nations to legalize sports betting to establish a safe and effective framework that protects consumers and creates tax benefits for local communities. Why it is time for states and sovereign tribal nations to legalize sports betting. 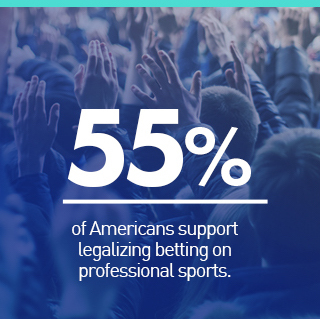 Results from two national surveys conducted by the Washington Post, in partnership with the University of Massachusetts-Lowell, and the American Gaming Association with Greenberg Quinlan Rosner (GQR), show Americans believe it’s time to legalize sports betting. The state of sports betting is a dynamic issue. Check here for the latest news and information.